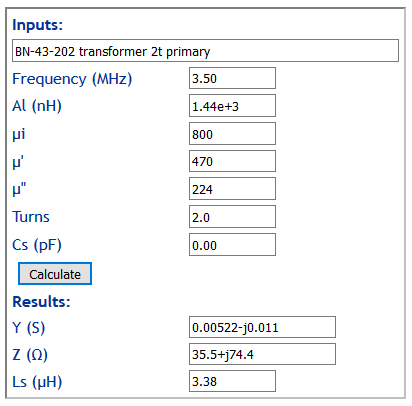 A first approximation at the low frequency end with a medium µ core is that it is like an ideal transformer withe the magnetising impedance in shunt with the primary. 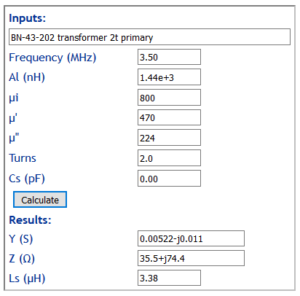 The datasheet for a BN43-2402 balun core gives Al=1440nH/1t. 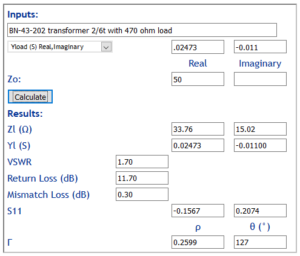 Finding the magnetising impedance of the primary at 3.5MHz with Calculate ferrite cored inductor (from Al) we get the following. For this calculations, it is more convenient to work with the admittance Y. I have ignored Cs as it will make little difference to this calculation. Lets add to it the transformed test load of 470Ω (G=1/470) for a combined Y=0.02473-0.011S. The expected input impedance and VSWR of the simple model is 33.8+j15.0Ω and 1.7, not too far off his measured 36.6+j16.1 and 1.6. For a low Insertion VSWR 9:1 transformer, the low end VSWR might be higher than desired and adding 1t to the primary and 3t to secondary would be worth measuring.